Womack Creek is in the middle of its spring flowering. 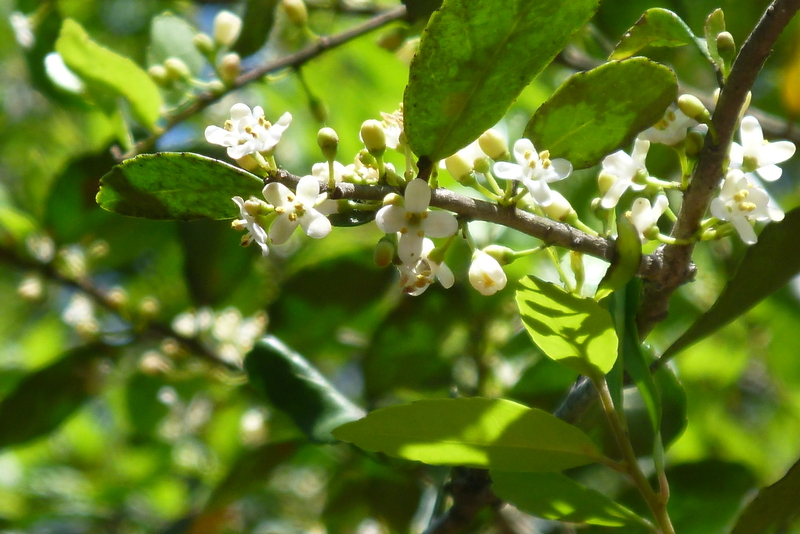 The blooms above, Rusty Blackhaw had a back drop of Pinxter Azaleas right now at it’s full bloom. 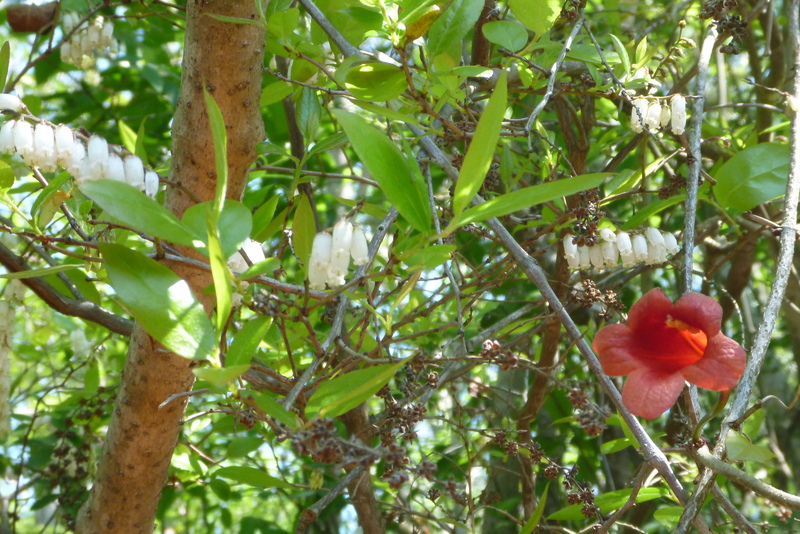 Fringe trees, cross vines, yaupon holly are all blooming. And poison ivy. Swamp sweet bells are just beginning to bloom. Below with cross vine. 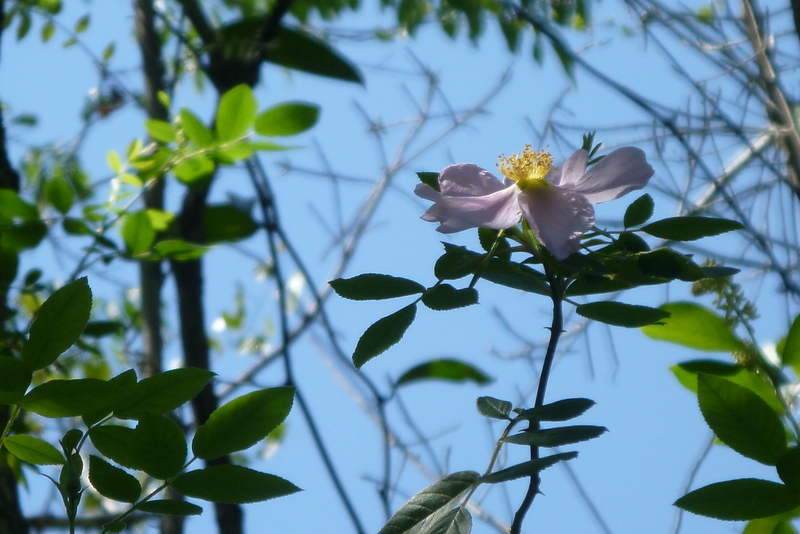 Two swamp roses were blooming, promising more blooms and fragrance. And the earlier bloomers are now going to seed and fruit. Pumkin ash and blueberries. 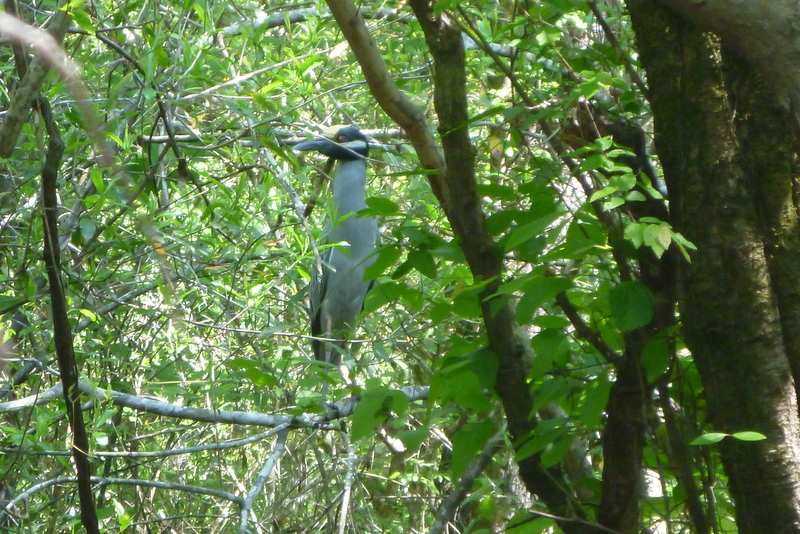 A kingfisher, an owl, a duck, cardinals and a yellow-crowned night heron — not much in the way of bird life. 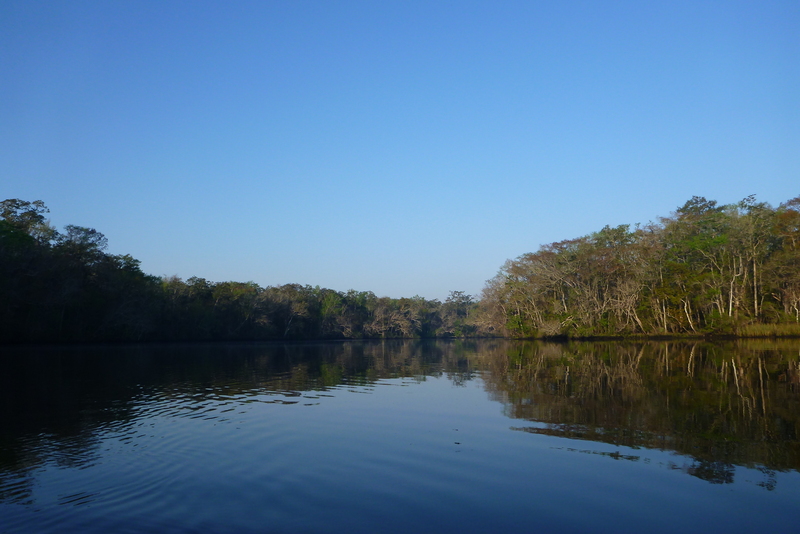 Get in your boat, canoe or kayak and check out the rivers and creeks of Tate’s Hell. 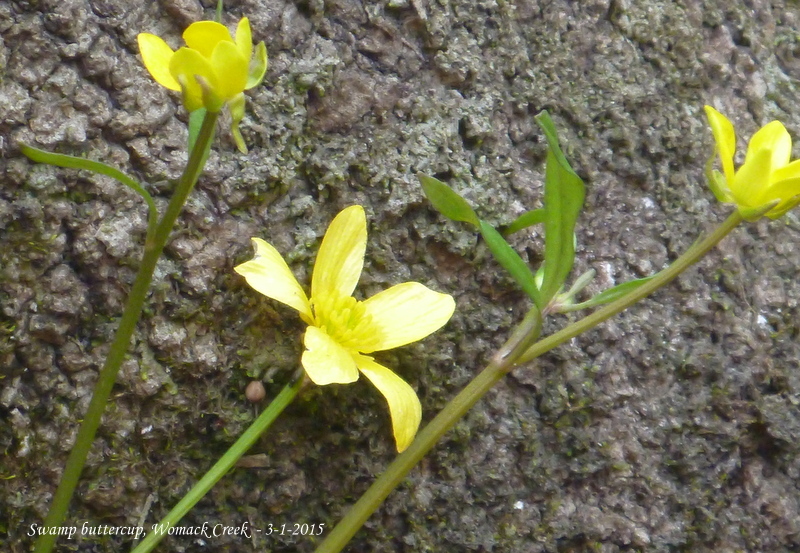 This entry was posted in Tate's Hell State Forest, Tate's Hell wildflowers, Womack Creek and tagged Florida native wildflowers, Tate's Hell State Forest, Womack Creek, Womack Creek paddling on March 29, 2015 by marylynanded. 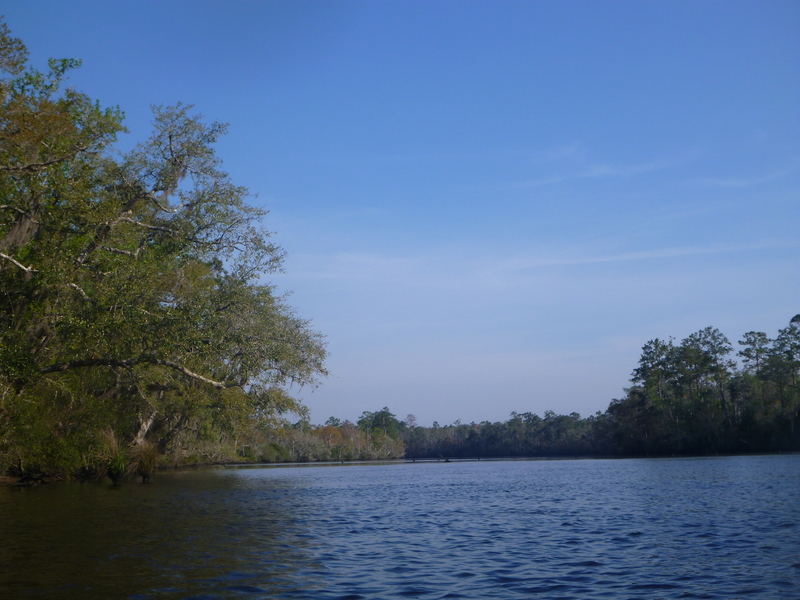 The afternoon Florida freshwater turtles presentation at the Apalachicola National Estuarine Research Reserve was not until 2pm, so we knew we had time for a short paddle from Womack Creek Campground landing on the Ocklockonee River to Loop Campsite landing on the Crooked River. 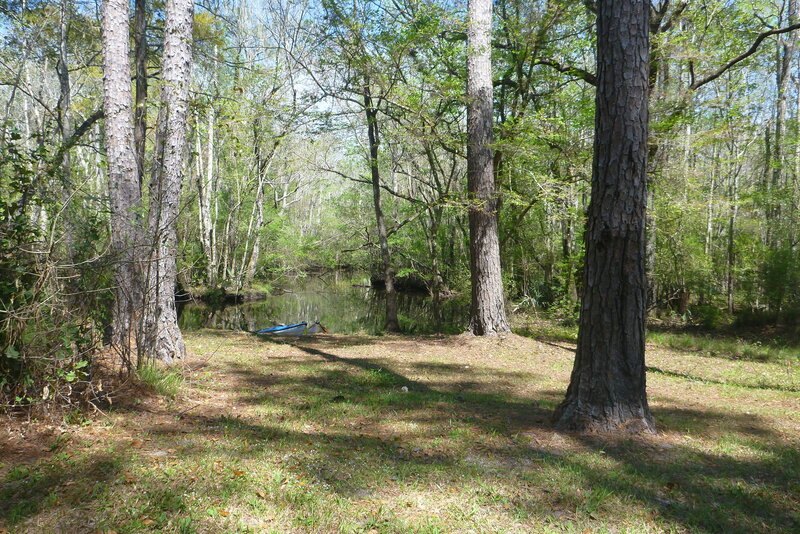 We had camped overnight at the Womack Creek Campground and paddled Womack Creek the day before. At 8;35 AM, we have never paddled the Ocklocknee River when it was so calm. For three miles on this beautiful blue-sky day, a tinge of coolness, but no wind. Quiet. Along the eastern bank of the Ocklockonee, the residents were not outside or were at work. We had the whole river to ourselves. We passed the rest house at the Womack Creek campground where Mack recently repainted the sign, so passing boaters could see that this was a public campground. 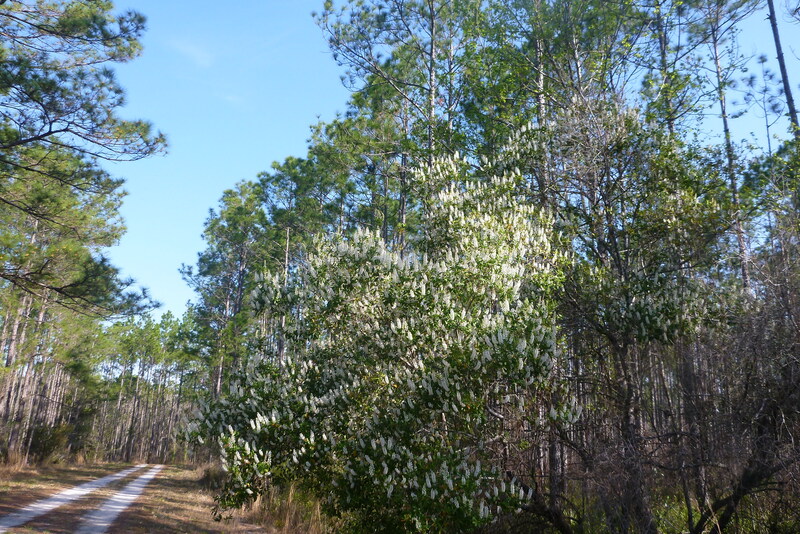 Wild olive or Devilwood were blooming along the way, along with pinxter azaleas and blackberry. At a bend in the Ocklockonee are pilings, remnants of a railway which carried turpentine across the river. On river right of the Ocklockonee is McIntyre Landing. The Crooked River is at this junction and continues west (crookedly) until it joins with the New River into the Carrabelle River. This river has tidal flow from both ends. At the mouth of the Crooked River is a little island. 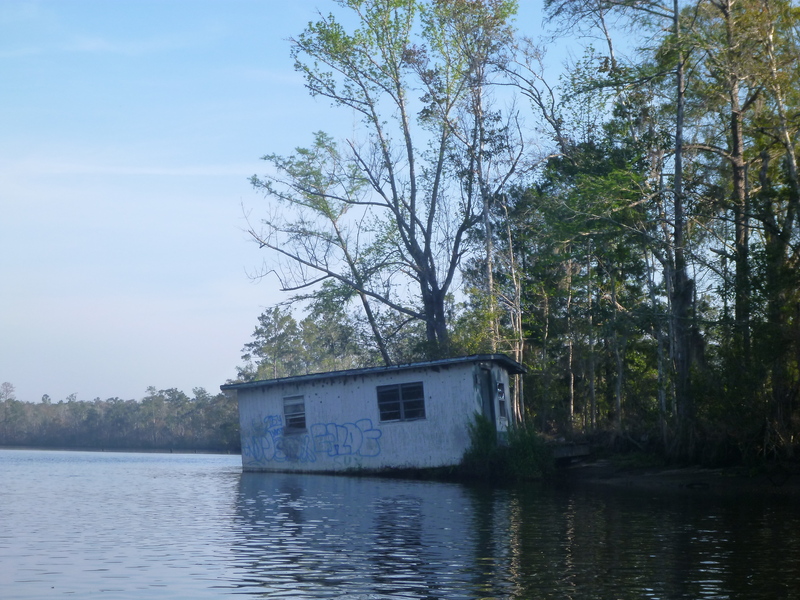 This houseboat has been mired on its banks for at least 4 years. The photo above shows how calm upriver Ocklockonee was from this junction. This photo shows the Crooked River at the junction. The tide was going out, but without wind and with still a crispness in the air, it was an easy paddle to Loop camp site. We’ve heard more cardinals in Tate’s Hell recently. A mile from the Ocklockonee, Loop camp site appears. It is one of our favorite places to camp. Last year while one of us was preparing dinner, the other, sipping tea, saw a big otter pop its head from the exposed roots in the water of a pine tree and quickly swim away. When the Ocklockonee floods, this campsite can be covered with water. Lots of room for tents, an RV or a trailer and lots of room for kids to play. And a nice launching area. When camping here, remember that paddlers who want to use the landing do have a right to do so and also to park their cars along the road. There is more than enough space in this and other single primitive campsite in Tate’s Hell for several tents. The rule applies to all Tate’s Hell Campsites: on the New, on Crooked River, on Ocklockonee River. On the way out, we received a beautiful farewell. 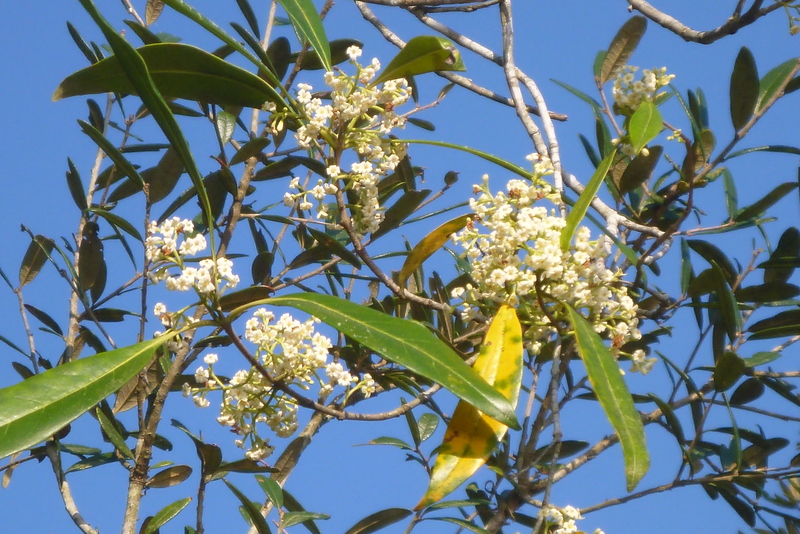 Titi are blooming everywhere in Tate’s Hell and beekeepers and bees are busy. 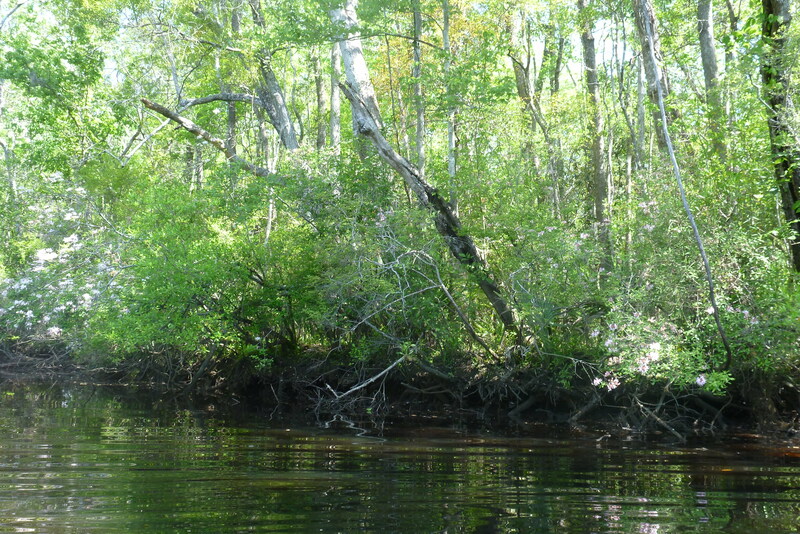 This entry was posted in Ochlocknee River, Paddling, Tate's Hell, Tate's Hell State Forest and tagged Ochlocknee River, Paddling Tate's Hell State Forest, Tate's Hell State Forest on March 19, 2015 by marylynanded. 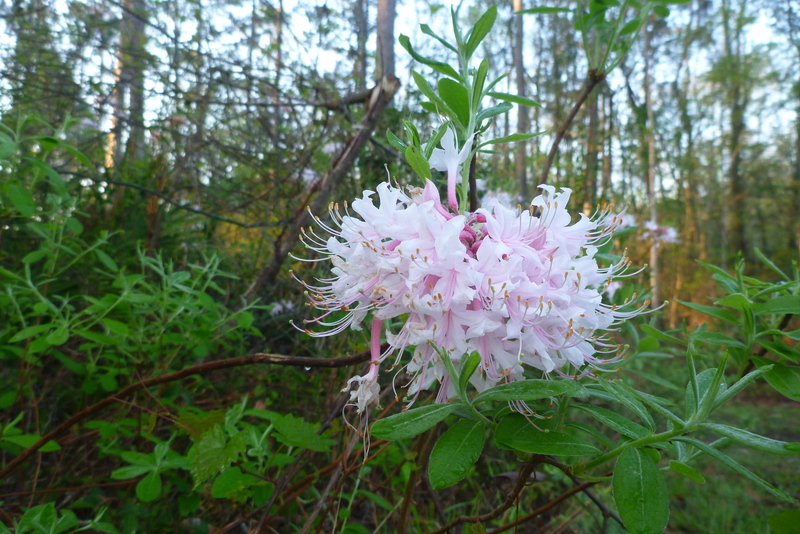 Womack Creek in bloom — see and smell the Pinxter Azaleas now and for the next 3 weeks! St. Patrick’s day, at 11:30 pm. It was perfect paddling weather — in the low 70’s. 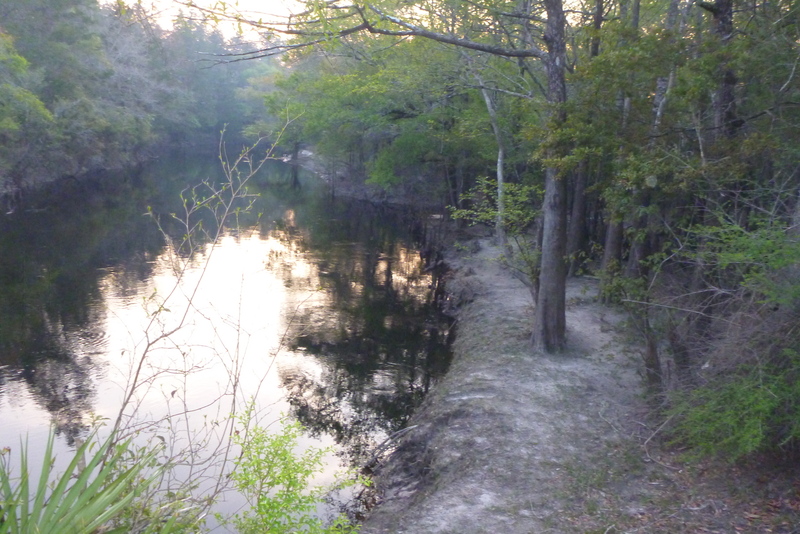 There was a slight breeze which rippled the surface of the Ocklockonee River, but the trees, even with the early leaves, protected Womack Creek. The colors were spring — shades of light green, tinges of red with a few red maples still asserting its shiny red colors — a continuum of hue. 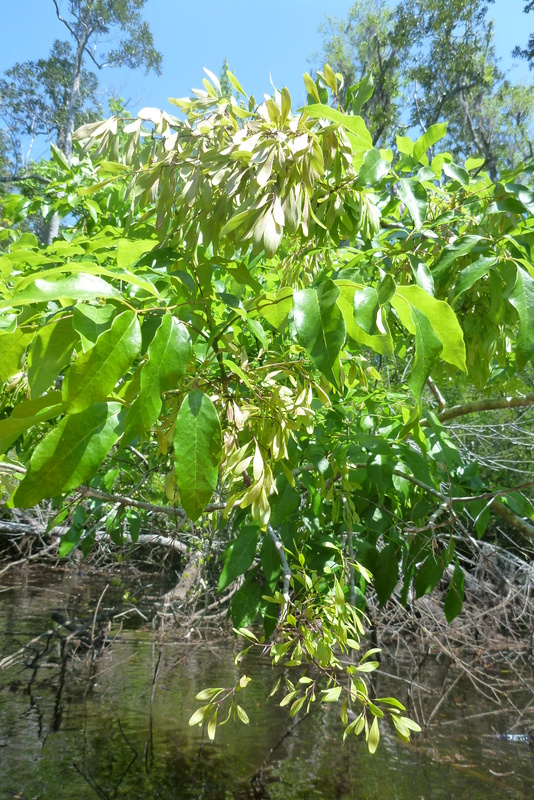 The bays with their darker, mature leaves added a depth to the colors of the scene. The woodpeckers were pecking, the ubiquitous kingfisher darted upstream and then down, the resident hawk could be heard and was seen, a great blue, which now seems a regular in that creek, and both barred owls’ dueling duets and great horned owl sounds at dusk and in the early morning. 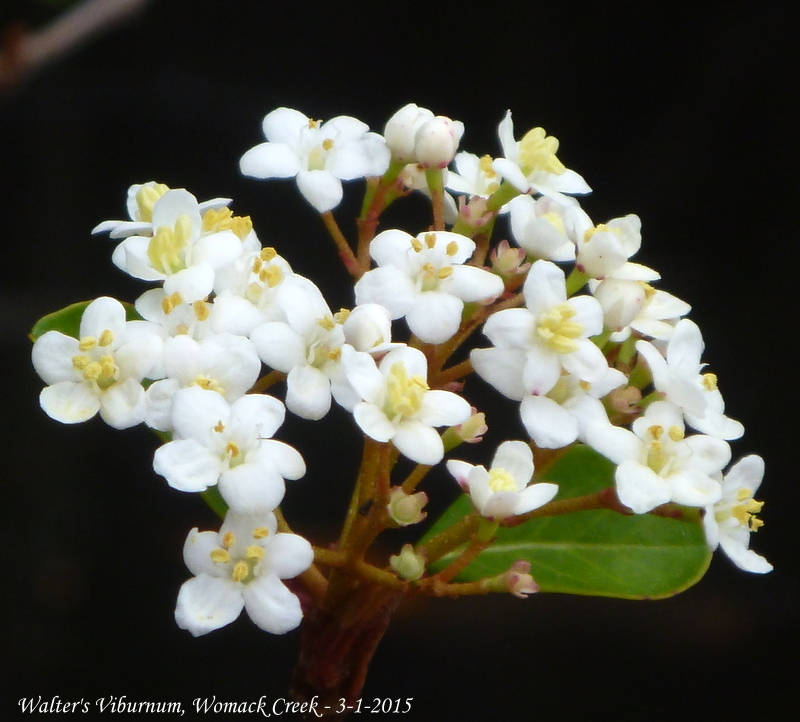 Walters viburnum is still in full bloom, but will not be so within a week of 70 degree weather, but the swamp dogwoods will be blooming soon and swamp sweetbells soon after. 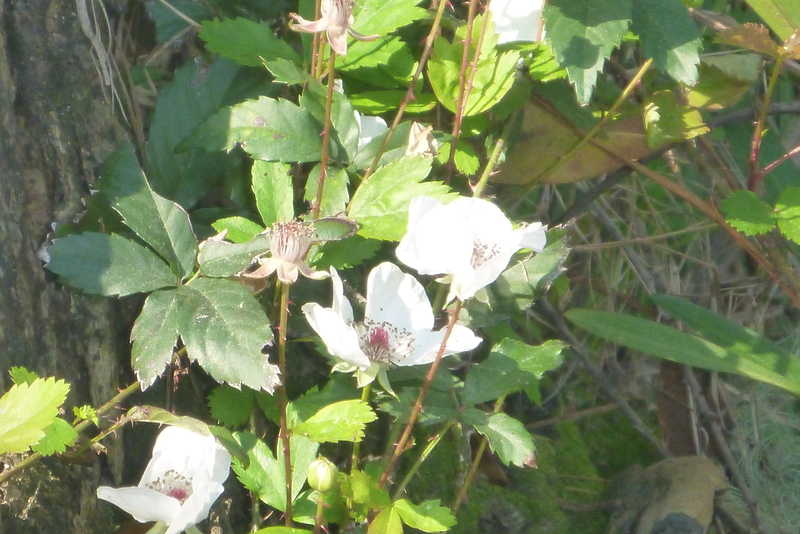 The blackberries are now in bloom and are the parsley haws. 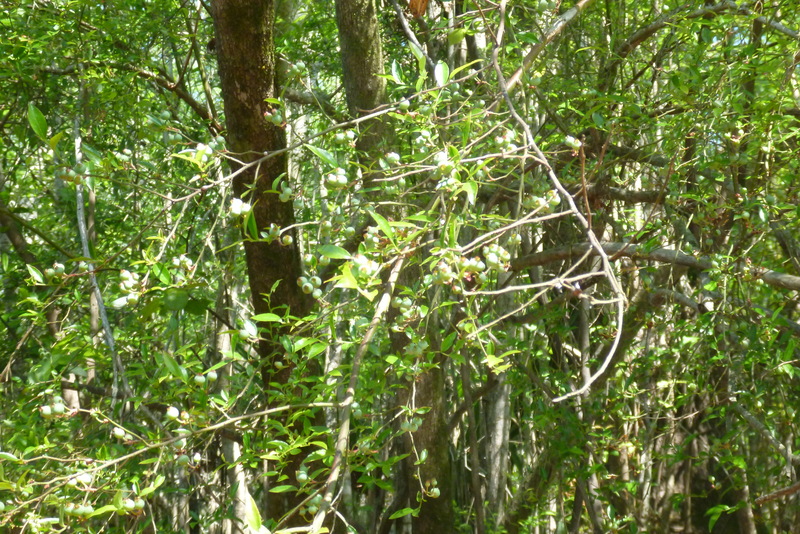 Ogeche tupelos are just beginning to start their leaf buds. 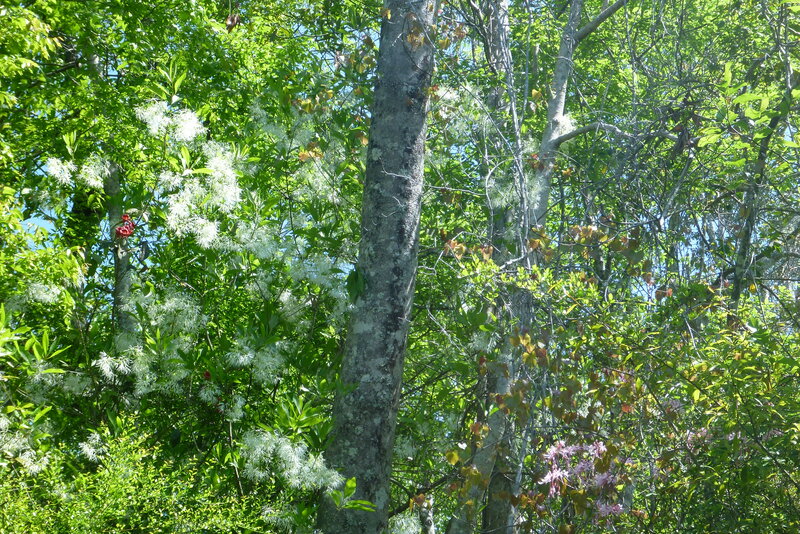 The swamp is alive with the sound and activity of life — carpenter bees and honey bees sipping nectar from the pinxter azaleas, nymphs hatching out, dragonflies and both the swallowtail butterflies flitting from flower to flower. 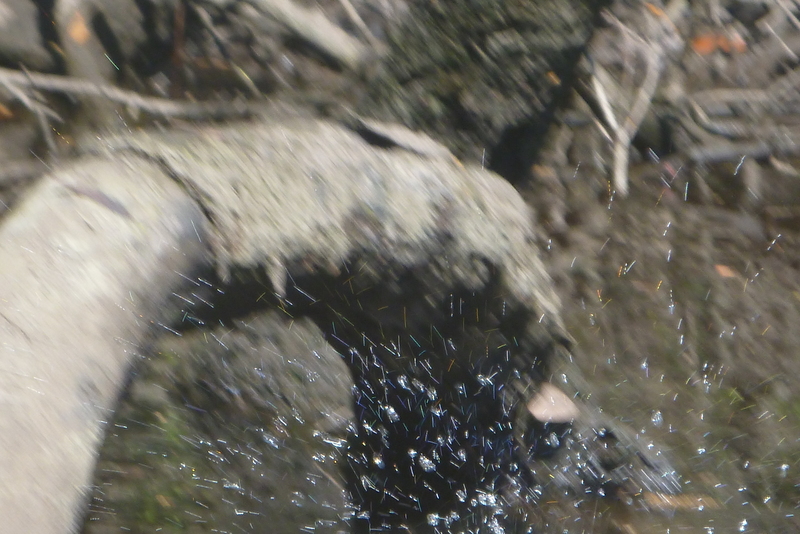 Young alligators — the creek may be a nursery — are never cautious. 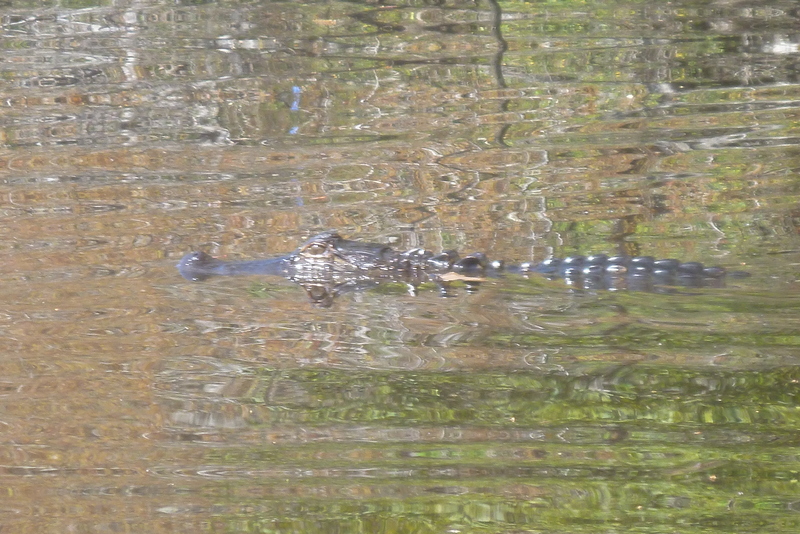 One cruised along my kayak, unafraid. 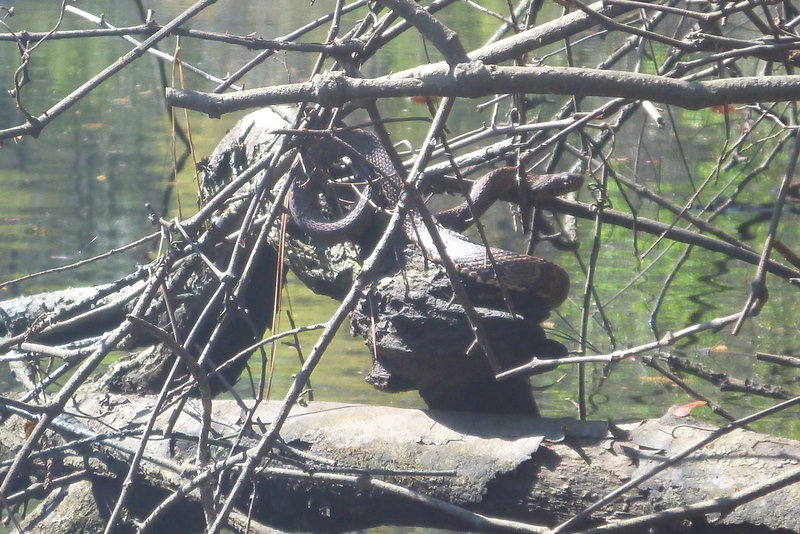 And a young brown water snake, less than a yard long, was out sunning, totally camouflaged against the brown/black branch. 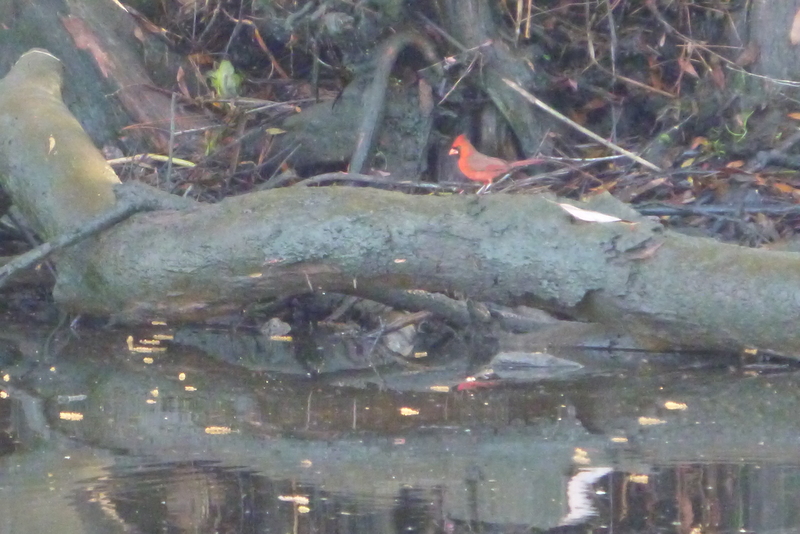 And even young cooters, some no larger than 5 inches, were perched on logs. 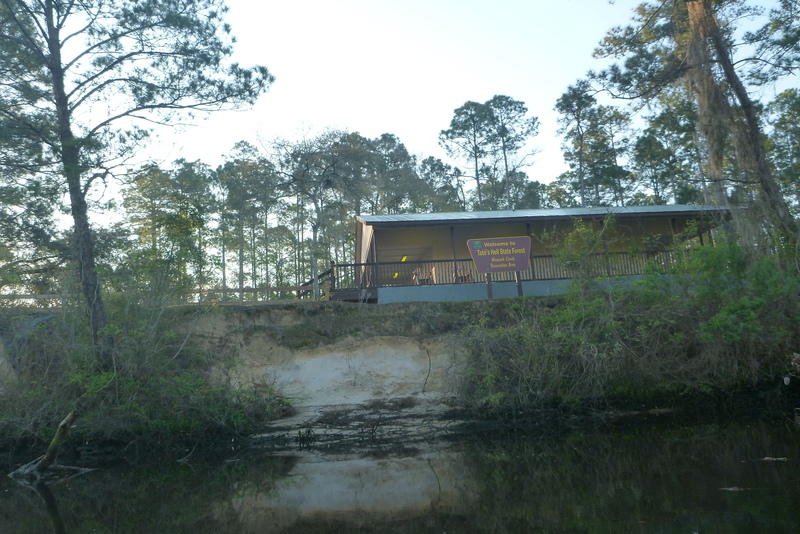 We camped there overnight to save a trip the next day to Eastpoint’s Apalachicola National Estuarine Research Reserve where we were looking forward to a talk on Florida’s freshwater turtles. Two years ago, on this same week (Spring Break for Leon County Schools), we had met a father and his two sons and their guests here. We did not camp last year during the spring break (we had taken two mothers and their four children to camp at Nick’s Road Primitive Camp site, which was reported on in an earlier blog). We did not recognize the older son, he is now a freshman at Leon High School, but he nudged our memory. This dad has taken his sons to camp and boat and canoe, fishing and hiking and just enjoying the Panhandle’s out of doors from the time they were very young. The young man related to me that he went camping with some friends overnight and he brought along a Coleman stove, water and some food. His friends made fun of him with all the gear he had, but they helped tote all that gear 2 miles to the camp site. In the morning, he got up, and had prepared for them when they got up coffee and spam and other goodies! Were they happy that he had some camping skills and to know that water and food are essential and he knew how to cook the food. Mack, a host to end all hosts, had at our campfire a load of firewood and fatwood to start the fire. The bathrooms were immaculate and freshly painted! The picnic table was pressured washed clean and the fire pit was clean and ready to start. The day before a couple from Alaska had camped. There seem to be more out of town campers than in state. 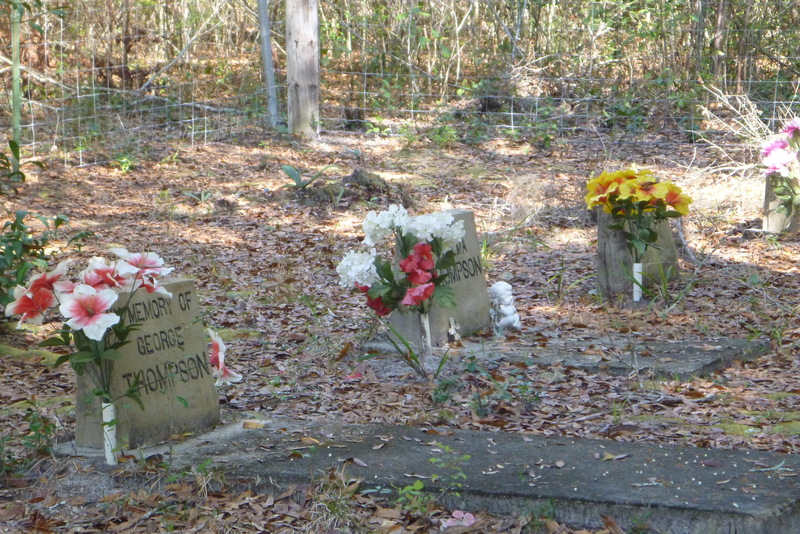 What a shame — for a north Florida experience without being packed between RV’s and trailers, this is one of our favorite places. The day we broke camp, Paddle Florida, which we had joined last February to paddle 5 days on the Withlacoochee, arrived with 40 paddlers. Unlike last year, when every day but one was a rain day, and that brought a blustery winds which make doing Ochlockonee Bay treacherous, this year’s group will have perfect paddling weather. We checked the New River — it is very low. We were hoping to camp at Campsite 7 next week and paddle upstream, but it does not look promising. When it is low there are too many big trees which have fallen over the river to paddle. When the river is high, one merely paddles over them. A federal forester, now retired, told us that when the deciduous trees start leafing on the New River, they guzzle up water like marathoners and paddling will require portaging and dragging. 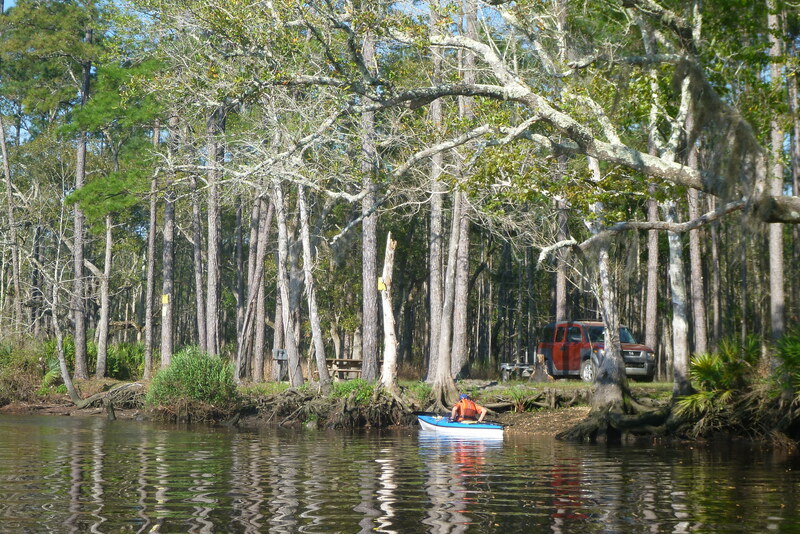 The next day we paddled from the Womack Creek Campground on the Ochlockonee to Crooked River, all bounded by Tate’s Hell land on one side, to Loop Landing campground. 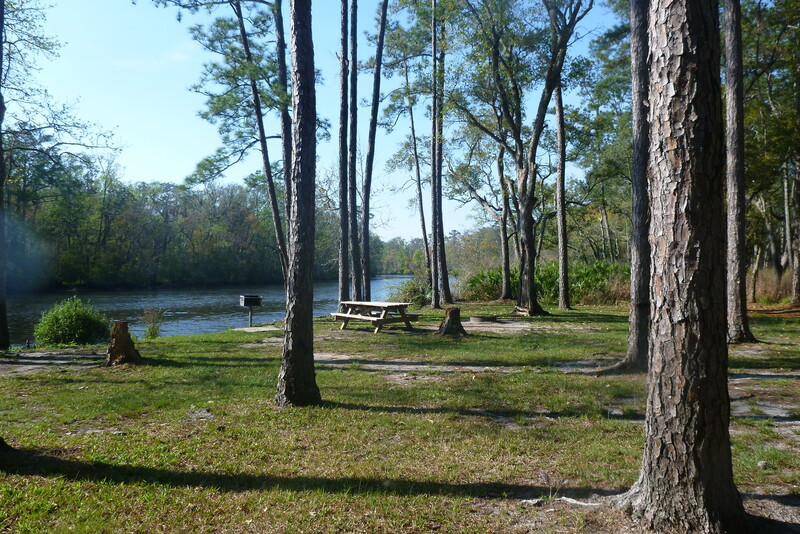 This, too, is another isolated campground which we like to camp — right on the Crooked River. It’s a 4 mile paddle. 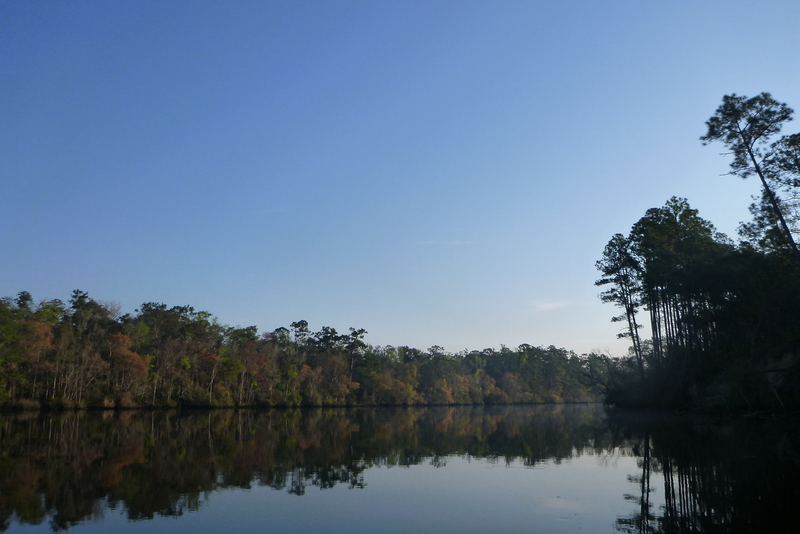 We started out at 8:35 a.m. and never have we paddled the Ochlockonee when it was so calm. 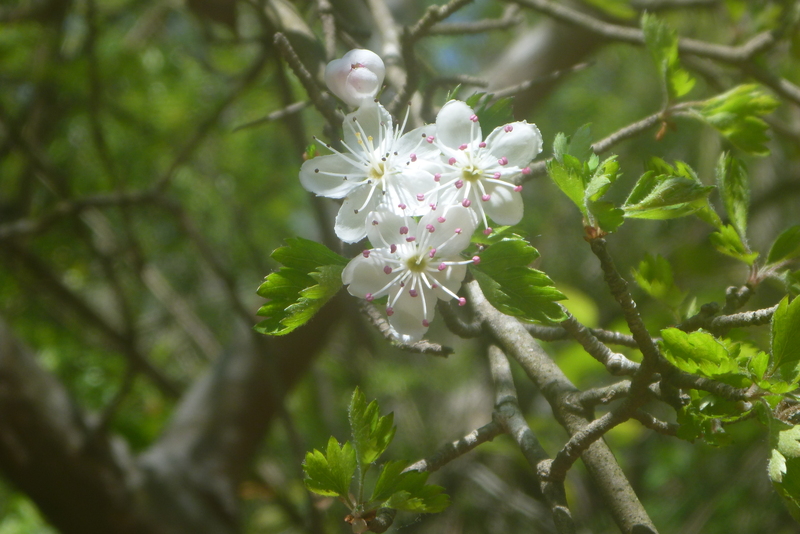 Pinxters are blooming there also as are Devil wood with its white blossoms and blackberries. 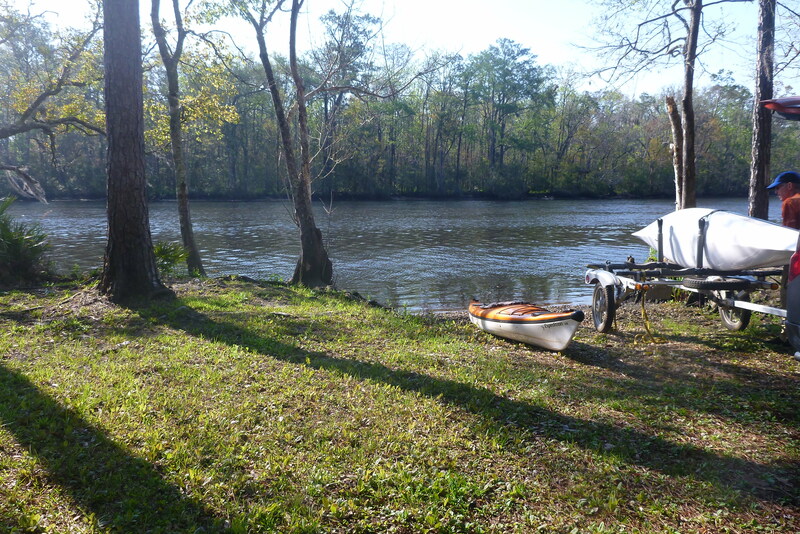 We paddled to McIntyre landing on the Ocklockonee which is at one end of the Crooked River. The posts which once supported a train track on which trains hauled turpentine from one side of the river to the other are still there. Crooked River connects to the New on the west and is subject to tidal flow from both the Carrabelle River and the Ocklockonee River. We were against the tide that early in the morning, but it was a short paddle and the sky was blue, the air sweet and crisp and spring in the air. We had parked our car and trailer at Loop Landing, which is only 2 miles from Womack Creek Campground — one could walk to get one’s car if one is camped at Womack. Go paddle Womack now and throughout April — the creek is blooming and there will be a succession of blooms from now on. The splash from a little turtle’s jump. Nick’s Road landing — always a great place for lunch on Womack Creek. Picnic bench, grill and fire pit. Also a great place to camp — away from it all (from April through September, bring mosquito repellent). New River at Camp Site 7 — very low for March. 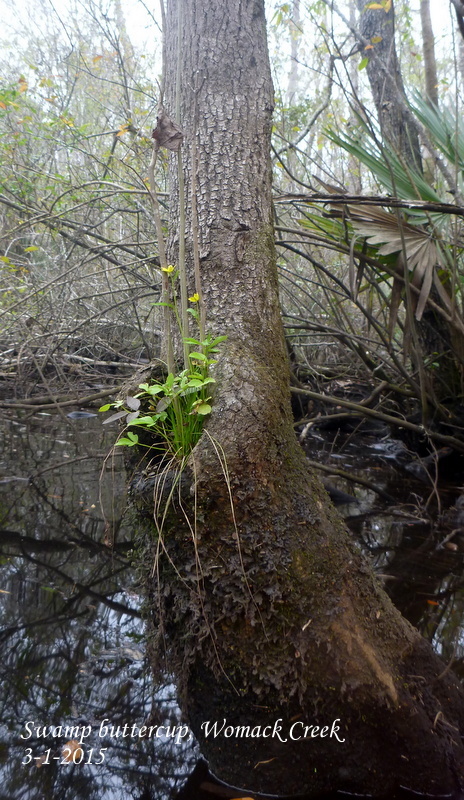 This entry was posted in Camping, Tate's Hell State Forest, Womack Creek and tagged Florida native wildflowers, Paddling Tate's Hell State Forest, Tate's Hell State Forest, Womack Creek, Womack Creek paddling on March 19, 2015 by marylynanded. Based on the weather predictions for the Womack Creek area on the last day of February, we made plans to do our monthly field trip on Womack Creek, to note which changes had occurred since Valentine’s Day. The one hour drive was under overcast skies, the temperature was much warmer than any day the previous week, and we were expecting some break in the clouds and warming temperatures. So confident in yesterday’s weather prediction, one of us was in shorts and short-sleeved wicking shirt. The other, more skeptical and weather-wise, dressed in waterproof pants and long sleeves and and waterproof jacket. 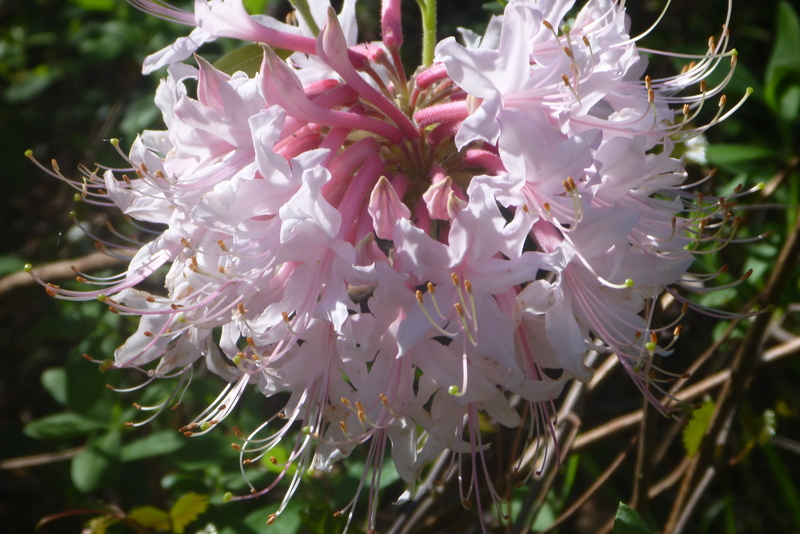 We were looking for new blooms of pinxter azaleas. 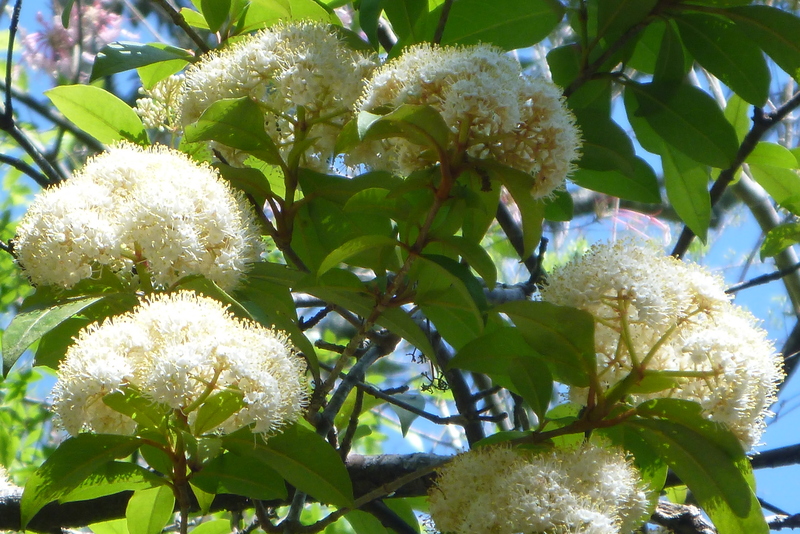 When these are in full bloom on the creek the air is fragrant and their delicate blossoms form impressionist-landscapes, particularly if swamp dogwoods or fringe trees are also in bloom. This is too early for that yet, but we were looking for more than that one bush we saw blooming two weeks ago. We saw three bushes in bloom. In two weeks the many bushes we saw with buds will begin to bloom. Walter’s viburnum is still in bloom, hopefully, if the temperature does not exceed the 60’s, they will still be in bloom when the pinxter azaleas come into full flower. 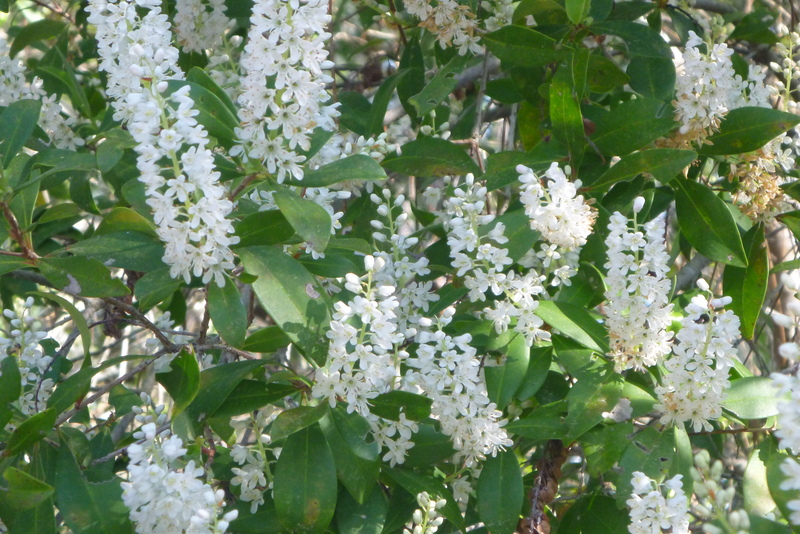 This photo is an enlargement of each bloom cluster — they are small, but a fully blooming bush is noticeable. 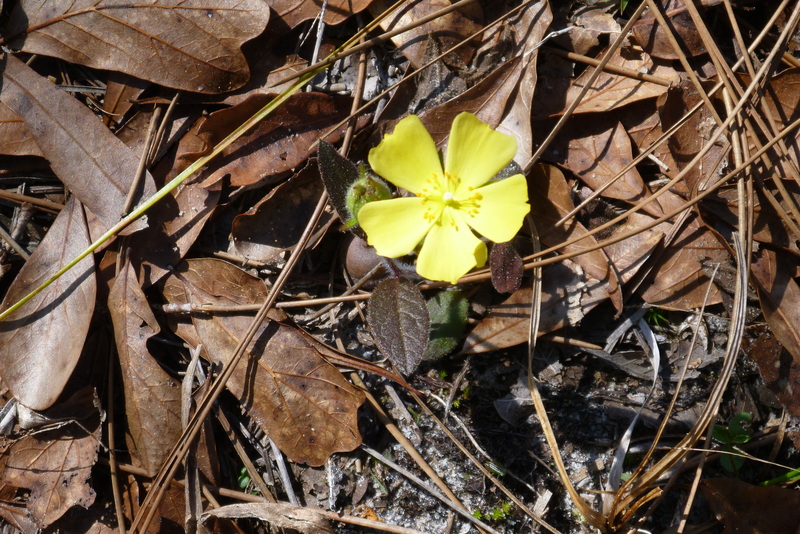 As we had expected, the swamp buttercup were beginning to bloom, the warmer temperatures inviting them to add golden dots near the forest floor. 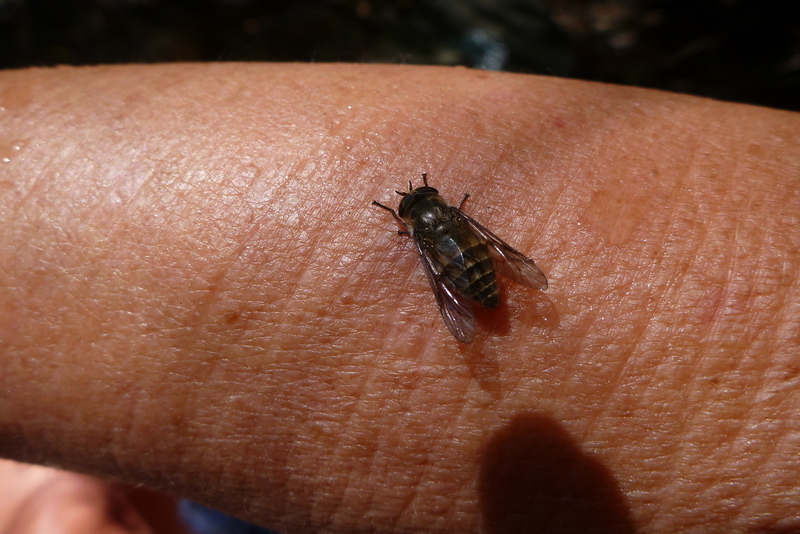 All living creatures must be opportunistic, finding niches and opportunities to propagate. This demure flowering plant is no different — wherever it can find soil, it will plant its roots. The blueberries are still in bloom, but this was a drizzly day and no insects were on the bushes. Red maples have gone to seed. Some red maple trees have both male and female flowers; others are only male and do not have seeds. 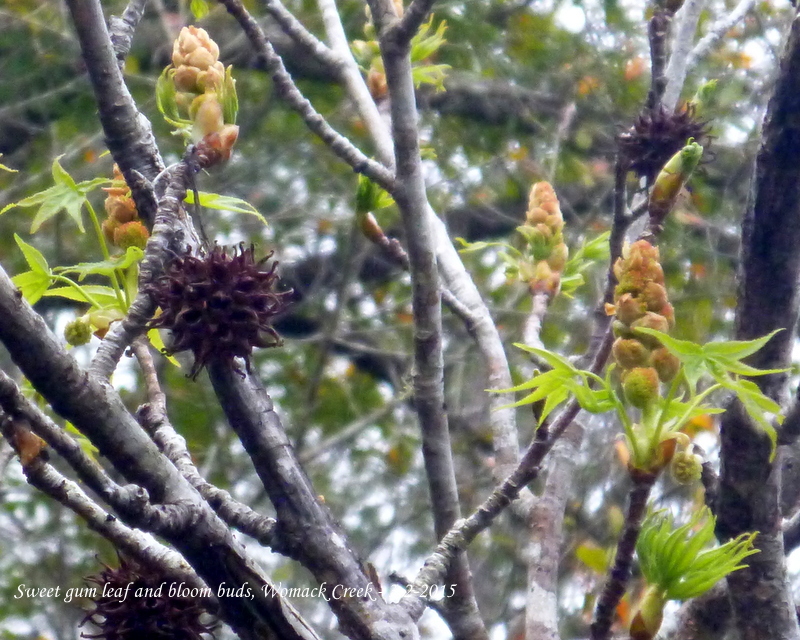 The male trees are putting out leaves, as are the sweet gums — tender leaves and bud clusters. Last year’s seed pods — beautifully sculptured spikes of roundness, still hang, most of its seeds already strewn into the waters below. 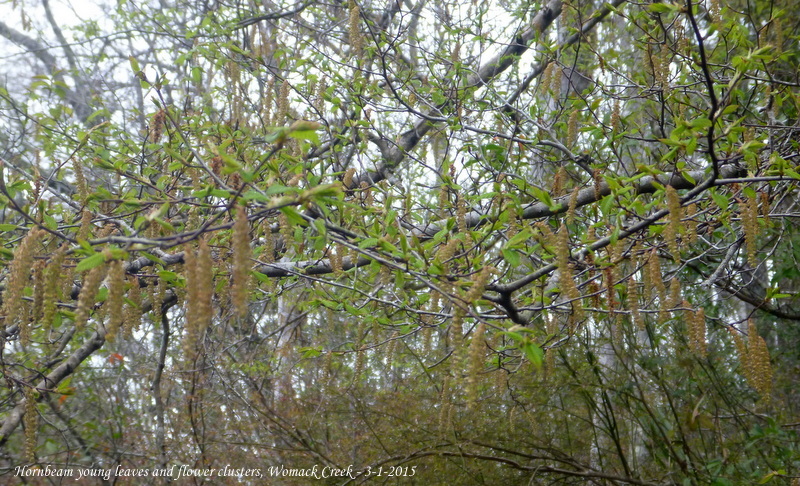 And hornbeams, the earlier leafing trees, are leafing with pendulous bloom clusters adding an ethereal look against the sinewy tree trunks. 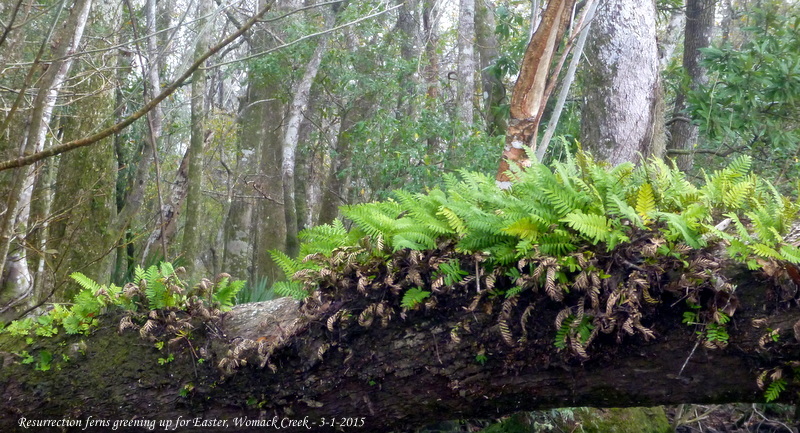 Two weeks ago the resurrection ferns were still brown. Today, getting ready for Easter, they, have, as they are named, coming back to life. We shortened our paddle and didn’t go all the way to Nick’s Road camp site landing. The optimistic one had to put on her waterproof jacket and, from her hatch, her waterproof pants, which lay on her legs, not worn — to keep her bare legs from freezing. The temperature did not go up much than the 62 F when we started, and the drizzle became more persistent. Blue skies or gray, there is always something new on Womack Creek. Today, we found another stand of green fly orchid and will be monitoring that to note when the new plants put out bud stalks. And even in this bleak landscape, we saw an eagle, a sparrow, a goldfinch, 2 hooded mergansers, and 2 cormorants floating downriver and enjoying a quiet, wet Sunday. Even on a drizzly paddle, one can easily be restored by nature. 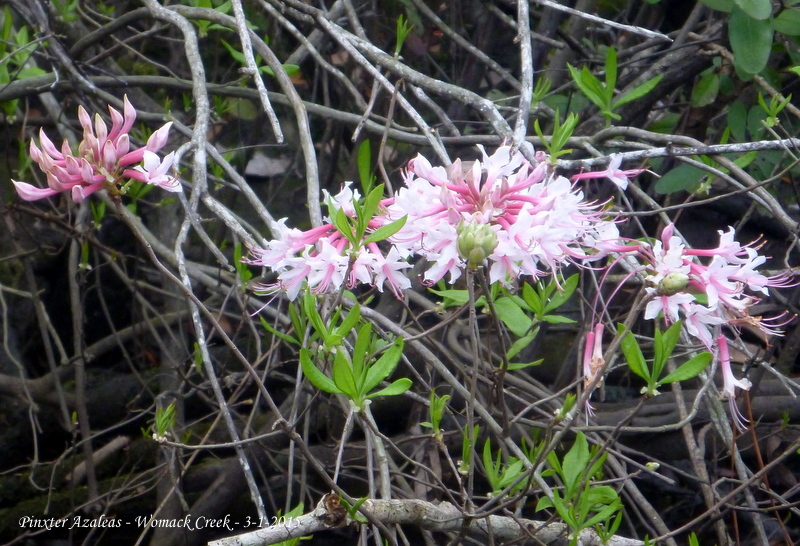 In two weeks, we expect more pinxter azaleas to be blooming and hopefully the beginnings of the swamp dogwoods, although this year, they seem very slow in leafing and no buds are detectable on the shrubs. And except for one or two parsley haw trees, this tree too, with its light pink/white blossoms seem a bit slow in leafing and budding. And the pumpkin ash will certain be blooming — the branches arching over the river should have purplish flowers. 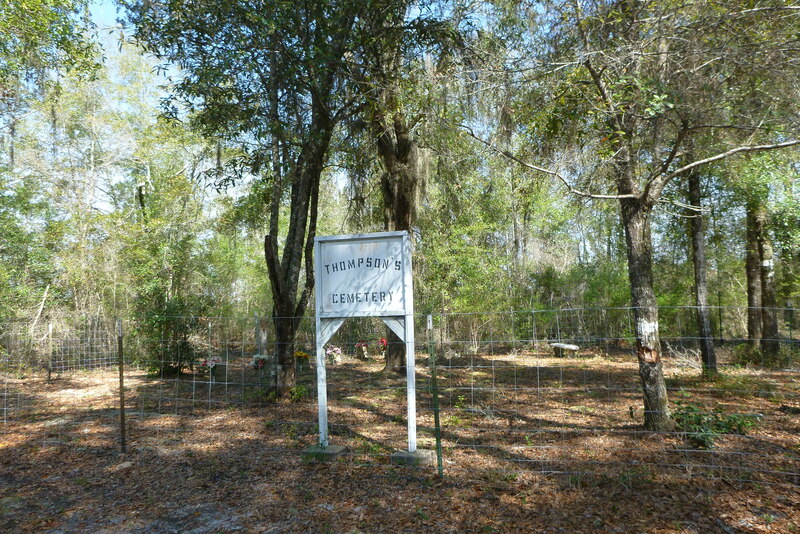 This entry was posted in Tate's Hell State Forest, Womack Creek and tagged Tate's Hell State Forest, Womack Creek on March 1, 2015 by marylynanded.